Art In The Bathroom? For Sure! Art belongs everywhere, not just in the living room or the bedroom. Well decorated bathrooms often feature art of all kinds, depending on the style of the bathroom itself. From minimalist art to Impressionist prints (which are particularly well-suited for the bathroom space), it gives a sense of thoughtfulness and beauty that can turn any bathroom from a purely functional space to somewhere in which you look forward to spending time. This gorgeous bathroom by Ben Pentreath, for example, uses a black and white wallpaper covered with retro drawings and lithographs for a retro, relaxing feel. The flowers and cups give a needed pop of color in this sea of black and white. In the same vein as the previous photo, this bathroom corner, from Habitually Chic, uses all the available wall space to display all kinds of art: framed pictures, hanging plates, and even some metal work. It takes a lot of thought to choose the perfect art that will all fit together in a single room like this, so choosing a theme, or at least a style, is essential. In this case, architectural art seems to dominate: towers and buildings are displayed in soft pencil drawings. The symmetrical placement also mirrors the nature of the buildings themselves: the tower stands above the two low, long buildings right below. Art can be great in large quantities if well chosen, but it can also be amazing when you have only one, or a few, pieces of art for focus and style. This black, wild bathroom by House of Honey features four related prints of flying balloons; coupled with the animal rug and suitcase, it gives the space a fantastical travel theme. Because the background is black, the pale print pops out, along with the bright colors of the rug. Black can be difficult to pull off in a bathroom because of the size, but with plenty of light and the right decoration accessories, it can become something truly special, as this example suggests. You don't need a dark background to make art pop, either. This bright white bathroom by Monika Hibbs shows that art can show really well when combined with other elements, for example hooks. Here, the prints are large enough to cover all the width of the three towel hooks, and then some. The theme is beachy, coastal, but still remains black and white to suit the rest of this bright and minimalist bathroom. A rug with just a touch of color gives some warmth and comfort. Here is another example of how white can provide the perfect background for a single, focus piece of art. This bathroom by House of Hawkes is all white and soft fabrics, along with painted shipslap on the tub siding, and painted hardwood floor. The portrait, set on the side of the tub (not hanged), instantly attracts the eye and gives a sense of movement to the space because of its position off to the side. If you want to keep your bathroom more minimal, a single, large piece of art is the perfect choice. It doesn't clutter your space, and you can feature something that has special meaning or simply fits the space you're trying to create. Most of the examples we've seen so far have been on the more feminine side of style, but this bathroom by Habitually Chic leans more on the masculine side. The off-white background, the interesting table-turned-vanity, and the 19th century pictures and paintings of different men gives us the distinct impression of a gentleman's bathroom. The placement of the pictures is mostly symmetrical and arranged in columns, but notice the slight crookedness of some of the frames, which gives the space a human, more messy side. Whether or not it was intended, it works to make the space less planned and more improvised. Many interesting things can be noted about this retro bathroom, found on DecorPad. The wainscotting gives it a traditional feel and perfectly frames the space for a freestanding tub with decorative legs. However, the large piece of Chinoiserie art brings it all together. The cream background for the painting echoes the paint on the wainscotting, and the pale blue ink complements the shade. The Chinoiserie style harks back to the Victorian era, and we get a definite retro feel thanks to the tub and the chandelier. The painting has a width similar to that of the tub, which keeps the proportions balanced. Lovers of graphic art can use a more minimalist style to highlight their tastes, as this design from DPages shows. A concrete floor and white marble backsplash provide a neutral background on which to display visually interesting features, like the curves of the tub or the very large mirror. But what attracts attention here is the off-centre art, which is mostly black and white graphic art. The off-centre position makes the space look more spontaneous and gives it some life, which minimalistic spaces often lack. The choice of low-key, small pieces of art lets you appreciate the whole effect rather than focus on a single frame. 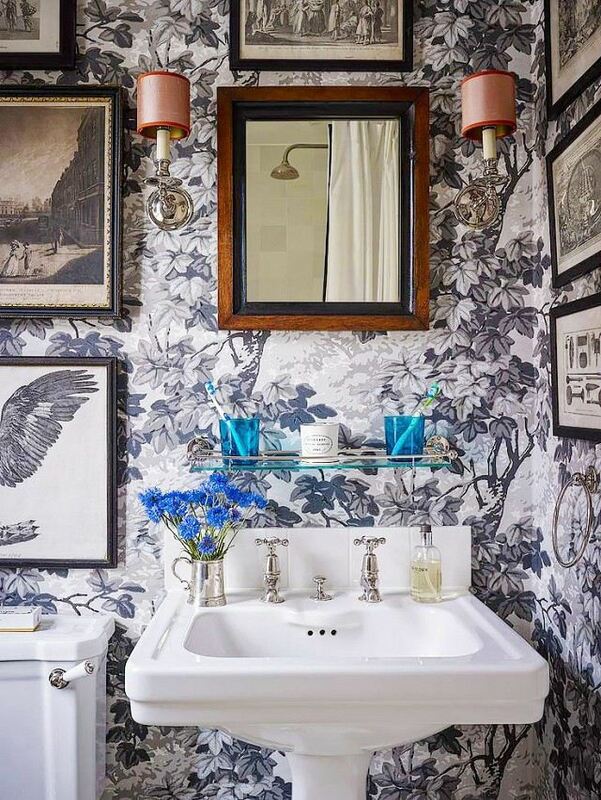 This Victorian-style bathroom by Aston Matthews sits somewhere between featured art and a gallery. Seven pictures--cityscapes and flowers, all colorful and Impressionistic in style--were carefully chosen and then hung on the walls. The whole feels "thrown together", a hallmark of good Parisian design. Except nothing in this space in haphazard; it only gives the impression that it is. As in the gentleman's bathroom above, the frames are not quite hung exactly straight, giving this space the same kind of spontaneous energy, except with more colors. The aqua and plum color contrast brings out the details of the art. A dainty lace bath rug and a colorful woven rug on the lower level add feminine style and energy.